The last thing Boston Detective D.D. Warren remembers is walking the crime scene after dark. Then, a creaking floorboard, a low voice crooning in her ear. . . She is later told she managed to discharge her weapon three times. All she knows is that she is seriously injured, unable to move her left arm, unable to return to work. "Lisa Gardner delivers an intelligent, sophisticated, psychological thriller. . . Gardner continues to show why she is on the short list of top thriller writers today." "When it comes to delivering riveting, complex female protagonists, Gardner is in a class by herself." "Absorbing. . . Gardner repeatedly ratchets up the tension while the strange relationship between the two mismatched siblings leads to a deadly climax." "If you think Gardner pulled out all the stops in D.D.’s previous cases (Catch Me, etc. ), you ain’t seen nothing yet. Better fasten your seat belt for this roller-coaster ride through family hell." "She's written another thriller that will keep fans gasping while drawing new readers into the vivid psychological narrative." 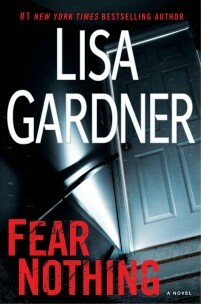 "Lisa Gardner is at her absolute best in Fear Nothing, particularly when she lobs a bomb or two into the proceedings, which she does to great effect. But the primary attraction here is the chilling, twisted and brilliant villain of the piece, who will have you checking under the bed as you read and long after you finish."